Ok with global warming and all these last few years I put my tomatos in early - 2 weeks before Memorial day weekend (One row of beans rotted and all the squash so I replanted them - the peas did fine). And it was warm no frost but maybe too wet. So I got these tiny white and brown spots on the lower leaves but seems like no bugs or mites and the newer leaves seem clean - should I do anything - I only had to use an oil or soap spray once 2 years ago when we had that Alabama tomato blight thing. I will see if can get a picture. I grow these thngs only because they grow OK usually here without any pesticides. Hopefully Picture to come. Its a fungus or disease, you can buy chemicals that you mix in a sprayer and spray the plants with. Daconil is the name of the chemical I think. You probably want to pull the limbs that are infested off. Too cool , too wet and not enough sun. We should be into nice enough weather not to do anything. If you feel your plants have been compomised to the point it will effect your expected yield, maybe some new plants. I had 43 degrees last night. It looks like he deluted a bag of concrete mix with 3 bags of sand and a bag of cow manure??? 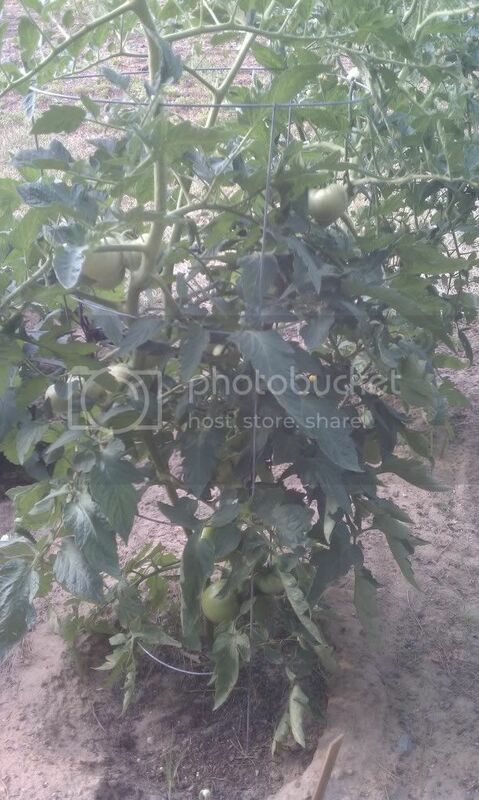 lol, to the OP in the future dig a hole about 8 or 10 inches deep and about 8 inches wide, fill it with garden soil and black cow, and pull the lowest limbs of and plant the tomato about 4 or 5 inches deep helps it root better. And calcium nitrate which is 15.5-0-0 is the only fertilizer required and helps with bottom end rot. Some of mine did the same thing. I just snipped them off. The tomatos I put in later didn't do that and are much larger than the ones I planted early. I had my cabbage and onions in 3rd week of February this year. The onions did good but the cabbage went to seed when we had a hot spell. These are a few we planted in the way I said above and we have a dozen more just like them. I'd guess he could make some purdy good sweet potato ridges! Thats why we dig the hole and fill it in with soil and black cow. First time since planting today. I was afraid of that - probably came with the plants? you must be getting some tomatoes by now. I'm starting to get some on a regular basis. I had some leftover plants so I tried this a couple weeks ago.They seem to be doing pretty good for just doing it. It helps a lot, due to the hot and dry weather its harder to keep them from getting bottom end rot, we are having it worse then usual this year. 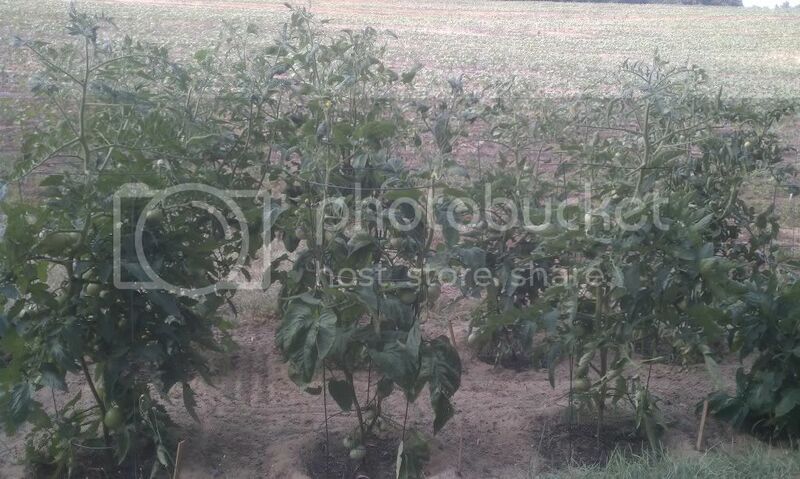 We have plenty of tomatoes, so many you cant keep up with them, we have been giving them away. I never use to have a problem either.. But we use to have a cat. It must of been enough to keep everything away?